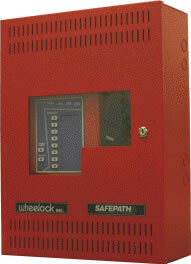 The Safepath SP40S is a Multi-Function Emergency Voice Evacuation System, Supervised Paging, Messaging, and Background Music System that can tie into your existing fire alarm or act as a standalone evacuation system. The SafePath system can deliver both audio and visual emergency notification to instantly provide specific detailed evacuation information for different types of emergencies including but not limited to , fire, weather, security, medical, gas leak and more. The system comes with 8 pre-recorded messages but custom messages can be recorded. A built in Microphone allows for Paging announcements and a music input can deliver background music. The Safepath system is capable of delivering 40 watts of supervised high fidelity audio power and 2 amps of supervised 24 VDC synchronized strobe power and is expandable to 5280 watts utilizing the SPB-80/4 (80 watts and 4 amps of strobe power), the SPB-160 (160 watts) or SPB-320 (320 watts) supervised audio power boosters.